En el extremo Norte de la Plaza Baja hay un edificio, identificado como 5C-49, que se conoce como el Templo Talud Tablero, el cual es el segundo en tamaño dentro del complejo de Mundo Perdido. Esta estructura con características arquitectónicas teotihuacanas respalda la evidencia de las relaciones de intenso intercambio comercial entre ambas ciudades, así como la revitalización del simbolismo teotihuacano por parte del gobernante Jasaw Chan K´awiil I. 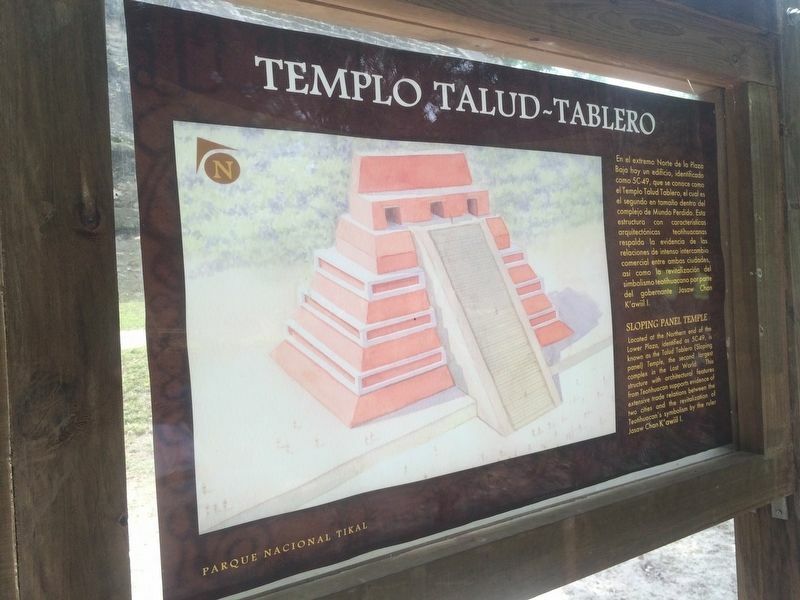 Located at the Northern end of the Lower Plaza, identified as 5C-49, is known as the Talud Tablero (Sloping panel) Temple, the second largest complex in the Lost World. This structure with architectural features from Teotihuacan supports evidence of extensive trade relations between the two cities and the revitalization of Teotihuacan's symbolism by the ruler Jasaw Chan K'awiil I. The Temple is in the background in this view. of Flores. Touch for map. The marker is to the south of the Sloping Panel Temple in the Lost World Complex at Tikal Archaeological Park. Marker is in this post office area: Flores, Petén 17001, Guatemala. Touch for directions. Other nearby markers. At least 8 other markers are within walking distance of this marker. Great Pyramid (within shouting distance of this marker); The Bat Palace (about 210 meters away, measured in a direct line); Twin Pyramid Complex N (approx. 0.3 kilometers away); Temple III at Tikal National Park (approx. 0.3 kilometers away); Temple II (approx. 0.4 kilometers away); Temple V at Tikal (approx. half a kilometer away); East Plaza at Tikal (approx. 0.6 kilometers away); The "Acanaladuras" Palace (approx. 0.9 kilometers away). Touch for a list and map of all markers in Flores. Regarding Sloping Panel Temple at Tikal National Park. The Sloping Panel Temple was built around 200 AD, just to the west of the older Lost World (Mundo Perdido) temple. It is considered to be part of the Low Plaza of the Lost World complex. The Teotihuacán mentioned in the marker text was a large city just north of modern day Mexico City. It formed the center of a vast trading network, reaching here to northern Guatemala, some 1300 km away. Teotihuacán was founded around 100 BCE. Research shows that it was sacked and burned around 550 AD. When the Aztec Empire reached Teotihuacán in the 14th century it was uninhabited. More. 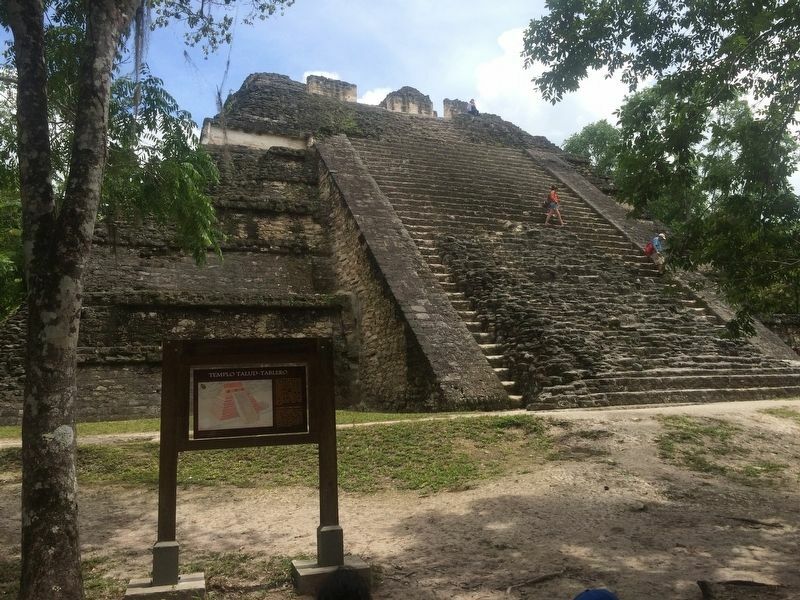 Search the internet for Sloping Panel Temple at Tikal National Park. Credits. This page was last revised on March 2, 2018. This page originally submitted on October 21, 2016, by J. Makali Bruton of Querétaro, Mexico. This page has been viewed 169 times since then and 5 times this year. Photos: 1, 2. submitted on October 21, 2016, by J. Makali Bruton of Querétaro, Mexico.